The rise and rise of this term has made it even harder to determine what to believe, although it has a very long dishonourable history. I’ve taken to checking and rechecking posts before commenting. But yesterday a friend posted an article claiming that the BCC and CNN had faked reports of chemical attacks in Syria. Both those organisations attract criticism for bias but are generally respected for their journalism, so I checked. It’s been debunked as invented by Russian journalists. Shortly after someone posted a very unlikely-sounding story about massive ill treatment and incarceration of LGBTx people in Chechnya, the source was Daily Mail and I refuse to click on Daily Mail links but I can Google it. Horrifyingly it’s true, with multiple reports from credible sources. 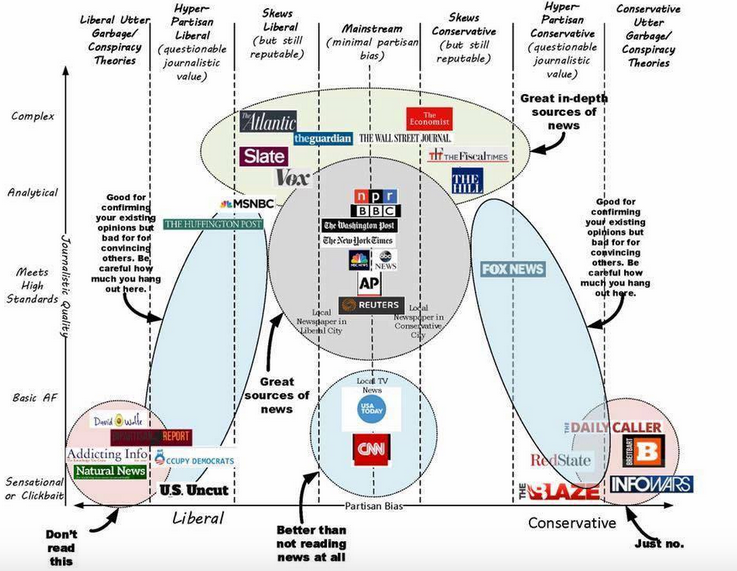 How can you tell if something is really fake news? Let’s be clear there are a number of ways a news report can be wrong. the news centre may have got its facts wrong. Reputable news organisations avoid this and apologise quickly when it happens. the news centre may have a stated bias, The Economist for example is slightly right wing, the Guardian is slightly left. You can read both of the same events. In fact that’s healthy. the news centre starts with a viewpoint and presents information to support that viewpoint. Most news centres are guilty of this at some point (and remember editorial is not the same as news). At last year’s remembrance service in London one news outlet claimed that the leader of the Labour political party had danced, and they had the pictures to prove it. facts are fabricated with the idea of changing your opinion, this is what I would consider “fake news”, and the above story that BBC/CNN had fabricated information on attacks in Syria falls into this category. As does a certain head of state’s statements on many issues. there are some great satire pieces out there, but as the news gets weird it can be hard to tell which is real. That is predicted by Poe’s Law. what quality is the source? is there bias in the reporting? is it a joke (satire)? I’ve seen some criticism out there already, from both sides, so please use this as a starting point to create your own guide on what to read. (Personally I’d have put “The Atlantic” to the right of the Grauniad). There is a call for the various social media to do more to prevent the publication of fake news – particularly following the climax of Pizzagate when a guy with a gun turned up at an innocent Pizza joint based on fake news reports. BBC’s Click Podcast covered some of the reasons that technology is not and easy, or complete, answer. 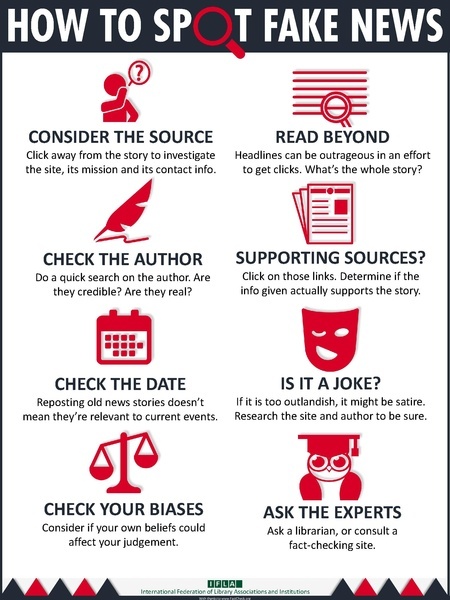 FactCheck.org produced a guide on spotting fake news, their whole article is worth reading but this infographic summarises the main points. Note that we need to check our own biases. A lot of news is being presented in a very binary fashion, with predictable partisan lines being drawn. Checking our own biases means being aware of how our own views play into what we want to believe. We all need to hold ourselves to a high standard in what we read, repeat, post, and believe. There’s no technical solution to fake news. It comes down to all of us paying attention. We need to find ways of distinguishing the real news, understanding our biases, being vigilant on what we believe and taking responsibility for what we post. It’s a good process, and will get you to an assessment of the quality of the journalism pretty quickly.